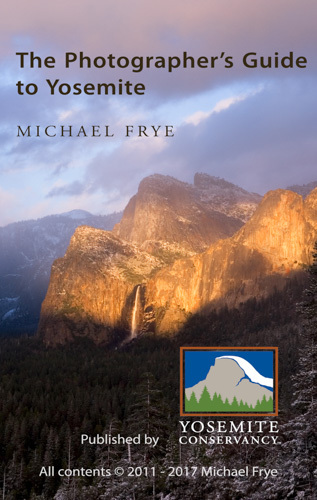 • In-depth descriptions of 40 outstanding locations including the classic Yosemite Valley views, high country, and surrounding areas. • Locations Filter – a unique feature that allows you to quickly find the best photo spots for any month and time of day. • Over 100 stunning photographs show you what you can see at each location. • Detailed maps and directions. • Clear, logical layout makes it easy to find the information you need. • Lots of photography tips to help you capture better images of the park, including Exposure for Digital Cameras, Composition, Depth of Field, HDR and Exposure Blending, Photographing Waterfalls and Cascades, Clearing Storms, and more. • Seasonal Planning Guide helps you find unique photo opportunities for each month. • Written by a 30-year Yosemite resident and leading expert on photography in Yosemite (that’s me of course!). • Based on the popular book, The Photographer’s Guide to Yosemite – the bible of Yosemite photography. At only $6.99, it’s cheaper than the book, but with more functionality! And a third of the proceeds from the sale of this app benefit the non-profit Yosemite Conservancy to help fund educational programs, restoration projects, and research in Yosemite National Park. • Fully functional without an internet connection. Please let me know how you like the app – and don’t forget to rate it and write a review in the App Store or Google Play!